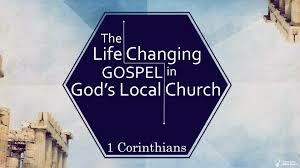 This week, we returned to the book of 1 Corinthians. After two messages on discipleship, one on the goodness of gender, and another on marriage, we picked up the theme of gospel-centered leadership. In 1 Corinthians 9 Paul uses himself as a model for self-effacing ministry, and in verses 19–27 he shows the great lengths he is willing to go in order to share the gospel. First, he shows what true freedom is (v.19–22)—the willingness to lay down his life for others, just like Christ did for him. Next, he speaks of his own self-discipline that enables him to serve the Lord and share in the inheritance that the gospel offers (vv. 24–27). In the middle (v. 23), he says that he does everything for the gospel. This is both the culmination of his gospel-centered service and the reason why he disciplines himself. You can find the audio here and Scripture references and discussion questions. For though I am free from all, I have made myself a servant to all, that I might win more of them. 20 To the Jews I became as a Jew, in order to win Jews. To those under the law I became as one under the law (though not being myself under the law) that I might win those under the law. 21 To those outside the law I became as one outside the law (not being outside the law of God but under the law of Christ) that I might win those outside the law. 22 To the weak I became weak, that I might win the weak. I have become all things to all people, that by all means I might save some. 23 I do it all for the sake of the gospel, that I may share with them in its blessings. What is freedom? How does our culture define it? How does Scripture define it? See Galatians 5:1–14. In what ways do you need to grow in your understanding of freedom? What is the greatest hindrance to becoming like others in order to share Christ? Is it compromising biblical standards, becoming too much like culture? Or is it refusing to cross boundaries, holding too tightly to personal preference and traditions? How does ongoing meditation on the gospel address both of those? Other than Paul, who is a good model of freedom leading to service? Or someone who has crossed boundaries to share the gospel? Do you feel a burden to win others to Christ? If not, how can you grow in cultivating a desire to ‘win’ others to Christ? How can we apply Paul’s teaching in 1 Corinthians 9:19–23 to the current discussion about Christian engaging their LGBT neighbors? WWPD? Widening the circle, how can we love those who identify by lifestyles that Scriptures defines as sinful? How can we speak truth in love? What is a ‘gospel-centered leader’? How does the gospel create leaders? Is someone who meets the character-qualities of an elder (1 Timothy 3, Titus 1), but fails to share the gospel really qualified? Why or why not? See 2 Timothy 4:2. What does it mean to discipline oneself and keep one’s body under control? How have you had success in that? What strategies do you employ? What responsibility do leaders have in modeling self-discipline? How can they do that? What role does the church play in helping you what in holiness and self-control? How can we improve?